The Toronto Real Estate Board reported a double-digit annual increase in condominium apartment sales in the first quarter of 2017. A total of 7,251 condominium apartments changed hands through TREB’s MLS® System during the first three months of 2017 – up 21.7% compared to the same period in 2016. Over the same period of time, the number of new condominium apartment listings entered into the MLS® System was down by 18.8% to 9,036 compared to 11,123 new listings a year earlier. Condominium apartments have historically been the housing type of choice for many first-time buyers due to the relatively lower price point compared to low-rise housing options. Given that more than half of intending home buyers are expected to be first-time buyers in 2017, according to a recent Ipsos poll conducted for TREB, it makes sense that demand for this housing type has remained strong. The average selling price for condominium apartments in the first quarter of 2017 was $489,551 – up 24.3% compared to an average of $393,858 for the first quarter of 2016. 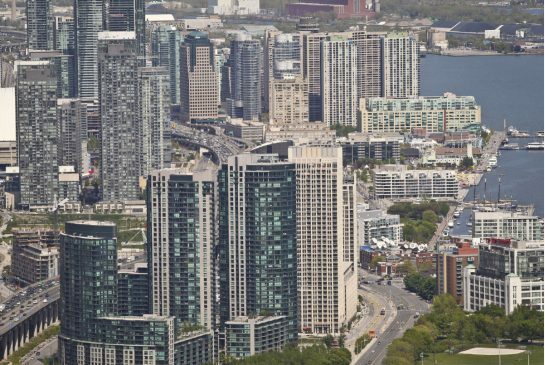 The average price was highest in the City of Toronto, at $521,842, representing a year-over-year increase of 24.3%. Market conditions became much tighter in the condominium apartment segment over the past year, with sales accounting for a greater share of listings. As competition between buyers increased further, the pace of price growth accelerated.